Meter readings and energy-saving notes for dual fuel use at home in 2014. Passed 17MWh generation on the first generation meter/FiT (75% of the roof), and savings from automatically switching the ADSL modem off-grid are a couple of percent of gross consumption. 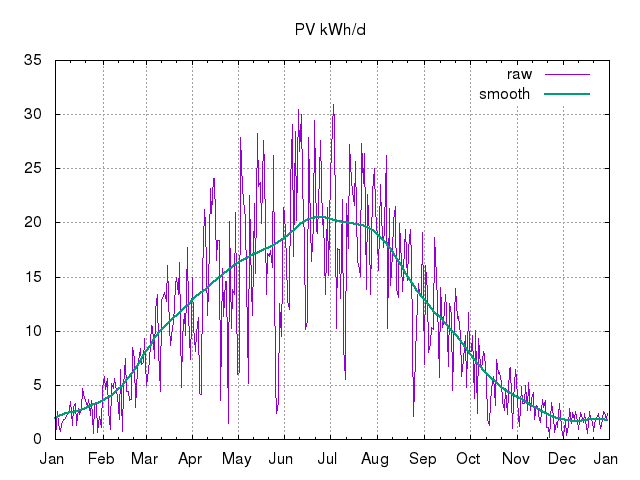 2014 data (kWh: e used 1678, e gen -3944, g 2997). 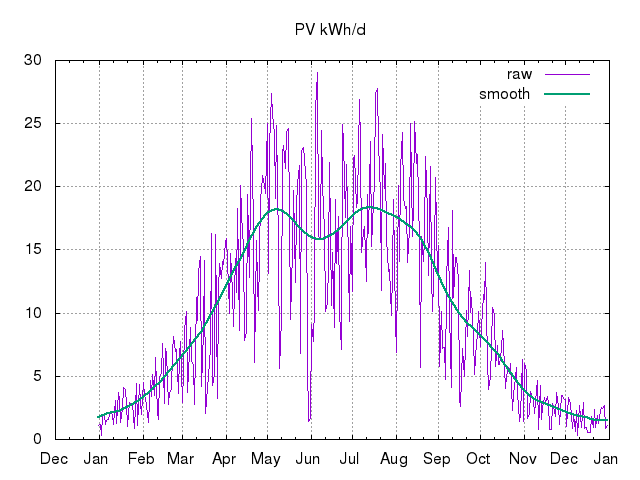 See the daily PV generation logs for 2016 as .csv and .png chart. 2014/01 190 (6.1/d) -76 (-2.4/d) 532 (17/d) 20131231-19:25-GMT to 20140131-19:02-GMT (31d) Meter readings: electricity generation 75.9kWh, export 48.5kWh, import 162.6kWh (thus net consumption (I+G-E) 190.0kWh); gas ~47.9m^3 (so 532kWh @ 11.1kWh/m^3). Imports passed 5MWh. Very mild and wet this month. HDD12=156 vs 231 last January (implying gas 2.8kWh/HDD12 at 3kWh/d baseload). 2014/02 131 (4.7/d) -145 (-5.2/d) 461 (16/d) 20140131-19:02-GMT to 20140228-18:17-GMT (28d) Meter readings: electricity generation 144.8kWh, export 117.5kWh, import 103.5kWh (thus net consumption (I+G-E) 130.8kWh); gas ~41.5m^3 (so 461kWh @ 11.1kWh/m^3). Boiler/CH problems this month: internal bypass in ~10-year-old boiler apparently inadequate following (furred-up) primary heat-exchanger replacement mid-month, so had to leave one rad on permanently which wastes energy. External bypass fitted 2014/03/14. Mildest February (lowest HDD12) in my records. HDD12=127 vs 230 last February. 2014/03 162 (5.2/d) -341 (-11/d) 365 (12/d) 20140228-18:17-GMT to 20140331-18:08-GMT (31d) Meter readings: electricity generation 340.9kWh, export 286.3kWh, import 107.0kWh (thus net consumption (I+G-E) 161.6kWh); gas ~32.9m^3 (so 365kWh @ 11.1kWh/m^3). HDD12=112 vs 254 last March. 2014/04 123 (4.1/d) -437 (-15/d) 137 (4.6/d) 20140331-18:08-GMT to 20140430-17:48-GMT (30d) Meter readings: electricity generation 436.7kWh, export 387.4kWh, import 73.6kWh (thus net consumption (I+G-E) 123.1kWh); gas ~12.3m^3 (so 137kWh @ 11.1kWh/m^3). Heating officially off at the boiler 25th, though only operating intermittently before then. HDD12=44 vs 121 last April. 2014/05 136 (4.4/d) -528 (-17/d) 132 (4.2/d) 20140430-17:48-GMT to 20140531-17:30-GMT (31d) Meter readings: electricity generation 527.5kWh, export 458.2kWh, import 66.6kWh (thus net consumption (I+G-E) 135.9kWh); gas ~11.9m^3 (so 132kWh @ 11.1kWh/m^3). Passed 4MWh generation on the newest 1.29kWp string, and passed 20MWh generation for entire system according to the Sunny Beam. HDD12=19 vs 50 last May. 2014/06 135 (4.5/d) -631 (-21/d) 116 (3.9/d) 20140531-17:30-GMT to 20140630-18:00-BST (30d) Meter readings: electricity generation 631.2kWh, export 552.7kWh, import 56.7kWh (thus net consumption (I+G-E) 135.2kWh); gas ~10.5m^3 (so 116kWh @ 11.1kWh/m^3). Savings from automatically switching the ADSL modem off-grid ~62% of the month when the batteries were full amounts to perhaps (7.7W*24*30*.62) or ~3.4kWh, ie 2.5% of gross consumption. HDD12=2 vs 8 last June. 2014 running total (Jan--Jun) 877 (4.8/d) -2157 (-12/d) 1742 (9.6/d) 20131231-19:25-GMT to 20140630-18:00-GMT (181d) Implies total footprint to date -227kgCO2: electricity (average 202W gross) -558kgCO2e @ 0.43kgCO2/kWh (netted), gas 330kgCO2e @ 0.19kgCO2/kWh. 2014/07 100 (4.1/d) -496 (-20/d) 85 (3.5/d) 20140630-18:00-BST to 20140725-06:38-GMT (24.5) Meter readings: electricity generation 496.3kWh, export 441.0kWh, import 44.9kWh (thus net consumption (I+G-E) 100.2kWh); gas ~7.7m^3 (so 85kWh @ 11.1kWh/m^3). Short measurement month due to fortnight holiday starting in last week of July. Passed 17MWh generation on the first generation meter/FiT (75% of the roof). HDD12=0 for whole of calendar July vs 0 last July. 2014/08 114 (3.0/d) -650 (-17/d) 83 (2.2/d) 20140725-06:38-GMT to 20140831-17:07-GMT (37.5) Meter readings: electricity generation 650.1kWh, export 595.9kWh, import 60.0kWh (thus net consumption (I+G-E) 114.2kWh); gas ~7.5m^3 (so 83kWh @ 11.1kWh/m^3). Long measurement month due to fortnight holiday starting in last week of July. Passed 16MWh exported, of which nearly 600kWh this (extended) month alone. HDD12=5 for whole of calendar August vs 0 last August. 2014/09 130 (4.3/d) -326 (-11/d) 99 (3.3/d) 20140831-17:07-GMT to 20140930-18:43-GMT (30) Meter readings: electricity generation 325.7kWh, export 276.5kWh, import 80.4kWh (thus net consumption (I+G-E) 129.6kWh); gas ~8.9m^3 (so 99kWh @ 11.1kWh/m^3). HDD12=5 vs 10 last September. 2014/10 143 (4.6/d) -175 (-5.6/d) 121 (3.9/d) 20140930-18:43-GMT to 20141031-17:51-GMT (31) Meter readings: electricity generation 174.6kWh, export 141.4kWh, import 110.2kWh (thus net consumption (I+G-E) 143.4kWh); gas ~10.9m^3 (so 121kWh @ 11.1kWh/m^3). Passed cumulative 18MWh generation on the first meter (3 strings). HDD12=15 vs 23 last October. 2014/11 155 (5.2/d) -86 (-2.9/d) 282 (9.4/d) 20141031-17:51-GMT to 20141130-18:29-GMT (30) Meter readings: electricity generation 85.9kWh, export 61.6kWh, import 131.0kWh (thus net consumption (I+G-E) 155.3kWh); gas ~25.4m^3 (so 282kWh @ 11.1kWh/m^3). Heating tested 6th, see graph and notes, and on properly after the 11th roughly. Expecting daily electricity consumption in Nov/Dev/Jan to be very roughly: 1kWh each for cooking, washing m/c, dishwasher, fridge/freezer, boiler, with about 0.5kWh for other things mainly TV and lighting. HDD12=79 vs 139 last November (ending the third warmest autumn on record). 2014/12 159 (5.1/d) -54 (-1.8/d) 585 (19/d) 20141130-18:29-GMT to 20141231-19:25-GMT (31) Meter readings: electricity generation 54.4kWh, export 34.8kWh, import 139.4kWh (thus net consumption (I+G-E) 159.0kWh); gas ~62.7m^3 (so 585kWh @ 11.1kWh/m^3). Rolled 6MWh imports over New Year's night. Christmas at home and lots of OpenTRV testing may have bumped up gas use! 2014 total (Jan--Dec) 1678 (4.60/d) -3944 (-10.8/d) 2997 (8.21/d) 20131231-19:25-GMT to 20141231-19:25-GMT (365d) Gas consumption an all-time low of just under 3MWh, probably because 2014 was a record warm year (HDD12 of 747 vs 1218 for 2013). Ecotricity estimates our annual electricity imports at just under 1.1MWh (and our bill was a bit over £10 less than this time last year), and annual gas use at ~2.8MWh (and our bill was a bit over £8 more than this time last year), with an estimated total not much over £400 per year. Mean gross electricity consumption ~200W, import ~125W. kgCO2 722kg (2.0/d) -1696kg (-4.6/d) 569kg (1.6/d) ~-0.41tCO2 (~-1.1kgCO2/d) gas/electricity emissions total for 4 people, based on 0.43kgCO2/kWh for electricity (netted) and 0.19kgCO2/kWh for gas, ie slightly carbon negative. Note that we haven't flown this year again, we still don't own a car and travel almost entirely by (usually-electrified) public transport. Page Media: video player raw video(0MB, 4.238s ) image. First published 2014-01-01 , updated 2019-04-22 . Site copyright © 2007-2019 Damon Hart-Davis. Hosted by ExNet.